There is a time and a place for refined desserts with their gold leaves, layers and tuiles and there is a time and a place (usually curled up on the couch watching a film at too late a time of the evening to be eating these things) for wonderfully stodgy, hearty desserts. Rhubarb season is upon us and I toyed with the idea of making little rhubarb jellies, some layered compotes or a chutney. But sometimes it's nice to take the easy option that still reaps great rewards. 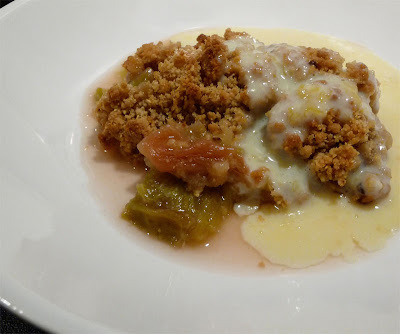 This is a traditional crumble with a slight twist - the ground almonds in the crumble mixture really help give it a nutty crunch and the ginger balances beautifully with the rhubarb. Preheat the oven to 180°C, gas mark 4. 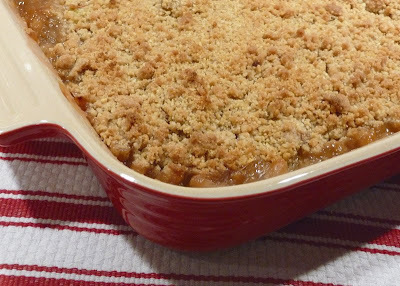 Put the sliced rhubarb in an ovenproof dish. Pour over the water, ginger and caster sugar and give it a good mix. Shove into the oven to get started while you make the crumble. Sift the flour into a bowl, add the butter and use your fingertips to rub the mixture together until it resembles breadcrumbs. Stir in the two sugars and the ground almonds. Scatter the crumble mixture over the rhubarb. Resist the temptation to pat the mixture down - otherwise you will get a hard slab of a crumble, not good. Bake for 35 minutes or so until the top browns and the rhubarb does that gorgeous bubbling around the edges. Serve hot with custard, cream or ice cream.